My work is diverse but my core subject is “light” or, more particularly, those moments of intense radiance that are as transformative as they are fleeting. Colours are vibrant and bold yet there is a subtle energetic quality (beyond the visual) that has been commented upon numerous times. People have described my work as ‘healing’, ‘mesmerizing’ and ‘like a portal into another dimension’. The latter statement was made by renowned energy intuitive Lee Harris who purchased one of my paintings. Acrylic: Acrylic paint is a fast-drying paint made of pigment suspended in acrylic polymer emulsion. Acrylic paints are water-soluble, but become water-resistant when dry. 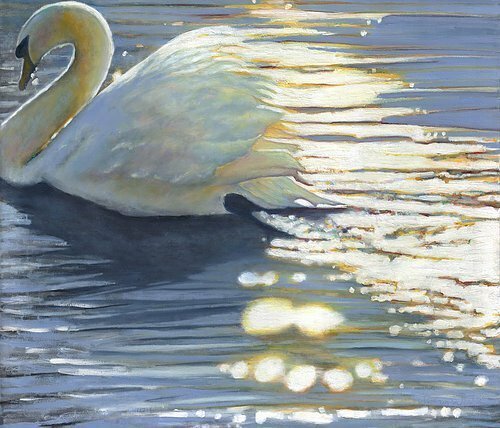 Depending on how much the paint is diluted with water, or modified with acrylic gels, media, or pastes, the finished acrylic painting can resemble a watercolor or an oil painting, or have its own unique characteristics not attainable with other media. Board: Paperboard is a thick paper-based material. While there is no rigid differentiation between paper and paperboard, paperboard is generally thicker than paper and has certain superior attributes such as foldability and rigidity. Canvas: Canvas is typically stretched across a wooden frame called a stretcher and may be coated with gesso before it is to be used; this is to prevent oil paint from coming into direct contact with the canvas fibres, which will eventually cause the canvas to decay. Collage: Collage is a technique of an art production, primarily used in the visual arts, where the artwork is made from an assemblage of different forms, thus creating a new whole. A collage may sometimes include magazine and newspaper clippings, ribbons, paint, bits of colored or handmade papers, portions of other artwork or texts, photographs and other found objects, glued to a piece of paper or canvas. Cotton: Cotton is a soft, fluffy staple fiber that grows in a boll, or protective case, around the seeds of the cotton plants of the genus Gossypium in the mallow family Malvaceae. The fiber is almost pure cellulose. Digital : Digital art is an artistic work or practice that uses digital technology as an essential part of the creative or presentation process. Encaustic: Encaustic painting, also known as hot wax painting, involves using heated beeswax to which colored pigments are added. The liquid or paste is then applied to a surface—usually prepared wood, though canvas and other materials are often used. The simplest encaustic mixture can be made from adding pigments to beeswax, but there are several other recipes that can be used—some containing other types of waxes, damar resin, linseed oil, or other ingredients. Pure, powdered pigments can be used, though some mixtures use oil paints or other forms of pigment. Gouache: Gouache is one type of watermedia (paint consisting of pigment, water, a binding agent, usually dextrinor gum arabic, and sometimes additional inert material) and is designed to be used with opaque methods of painting. Ink: Ink is a liquid or paste that contains pigments or dyes and is used to color a surface to produce an image, text, or design. Ink is used for drawing or writing with a pen, brush, or quill. Lacquer: The term lacquer is used for a number of hard and potentially shiny finishes applied to materials. Limited: A limited edition is a print with a fixed number of impressions produced on the understanding that no further impressions (copies) will be produced later. These are even signed and numbered by the artist. Linen: Linen is a textile made from the fibers of the flax plant. Linen is laborious to manufacture, but the fiber is very absorbent and garments made of linen are valued for their exceptional coolness and freshness in hot weather. Linocut: Linocut is a printmaking technique, a variant of woodcut in which a sheet of linoleum (sometimes mounted on a wooden block) is used for a relief surface. A design is cut into the linoleum surface with a sharp knife, V-shaped chisel or gouge, with the raised (uncarved) areas representing a reversal (mirror image) of the parts to show printed. The linoleum sheet is inked with a roller (called a brayer), and then impressed onto paper or fabric. Mixed Media: Mixed media, in visual art, refers to an artwork in the making of which more than one medium has been employed. “Mixed media” tends to refer to a work of visual art that combines various traditionally distinct visual art media—for example, a work on canvas that combines paint, ink, and collage could properly be called a “mixed media” work. Oil: Oil painting is the process of painting with pigments with a medium of drying oil as the binder. Commonly used drying oils include linseed oil, poppy seed oil, walnut oil, and safflower oil. The choice of oil imparts a range of properties to the oil paint, such as the amount of yellowing or drying time. Certain differences, depending on the oil, are also visible in the sheen of the paints. An artist might use several different oils in the same painting depending on specific pigments and effects desired. The paints themselves also develop a particular consistency depending on the medium. Original: Original works are uniquely created pieces. Though artists may create sets or series, “original” represents that there is only one in existence and is truly one-of-a-kind art. Panel: A panel painting is a painting made on a flat panel made of wood, either a single piece, or a number of pieces joined together. Pastel: Pastel is an art medium in the form of a stick, consisting of pure powdered pigment and a binder. The pigments used in pastels are the same as those used to produce all colored art media, including oil paints; the binder is of a neutral hue and low saturation. The color effect of pastels is closer to the natural dry pigments than that of any other process. Photography: Photography is the science, art, application and practice of creating durable images by recording light or other electromagnetic radiation, either electronically by means of an image sensor, or chemically by means of a light-sensitive material such as photographic film. Print: Printmaking is the process of making artworks by printing, normally on paper. Printmaking normally covers only the process of creating prints that have an element of originality, rather than just being a photographic reproduction of a painting. Except in the case of monotyping, the process is capable of producing multiples of the same piece, which is called a print. Screen: Screen printing is a printing technique whereby a mesh is used to transfer ink onto a substrate, except in areas made impermeable to the ink by a blocking stencil. A blade or squeegee is moved across the screen to fill the open mesh apertures with ink, and a reverse stroke then causes the screen to touch the substrate momentarily along a line of contact. This causes the ink to wet the substrate and be pulled out of the mesh apertures as the screen springs back after the blade has passed. Sculpture: Sculpture is the branch of the visual arts that operates in three dimensions. It is one of the plastic arts. Durable sculptural processes originally used carving (the removal of material) and modeling (the addition of material, as clay), in stone, metal, ceramics, wood and other materials but, since Modernism, there has been an almost complete freedom of materials and process. A wide variety of materials may be worked by removal such as carving, assembled by welding or modelling, or molded, or cast. Textile: Textile arts are arts and crafts that use plant, animal, or synthetic fibers to construct practical or decorative objects. Vinyl: Vinyl siding is plastic exterior that is an engineered product, manufactured primarily from polyvinyl chloride (PVC) resin. Voile: Voile is a soft, sheer fabric, usually made of 100% cotton or cotton blended with linen or polyester. Watercolor: Watercolor is a painting method in which the paints are made of pigments suspended in a water-based solution. Watercolor refers to both the medium and the resulting artwork. Woodcut: Woodcut is a relief printing technique in printmaking. An artist carves an image into the surface of a block of wood—typically with gouges—leaving the printing parts level with the surface while removing the non-printing parts. Areas that the artist cuts away carry no ink, while characters or images at surface level carry the ink to produce the print. The block is cut along the wood grain (unlike wood engraving, where the block is cut in the end-grain). The surface is covered with ink by rolling over the surface with an ink-covered roller (brayer), leaving ink upon the flat surface but not in the non-printing areas. The “Art Terms Glossary” is powered by Wikipedia under the terms of the Creative Commons Attribution Share-Alike license (CC-BY-SA). We are happy to provide a hassle-free experience with the shipping already included in the art price and offering shipment to any location in the world. There is no minimum purchase, coupons, or promotional codes are required. Just collect your art with one simple price! Have you found the same piece of art with another gallery at a lower price? Kyo Gallery will happily match that price up to seven (7) days after your purchase. We’re proud to provide peace of mind for all collectors with our 100% satisfaction guarantee. Return any piece of art within seven (7) days of receiving your order, and we’ll issue you a full refund, including shipping (on pieces 59″ and lower on the longest side). KYO GALLERY offers a seven (7) day money-back guarantee on all artwork and free return shipping. Have a return? Let us know by sending a message to: sales@kyogalleryonline.com. Return any piece of art within seven (7) days of receiving your order and we’ll issue you a full refund. You must use the original packaging for return shipping. The customer is responsible for return shipping on pieces measuring over 60 inches on the longest side and weighing more than 15 pounds, including a 10% restocking fee. For orders shipped outside of the United States, you are responsible for the cost of return shipping and any customs, duties, and brokerage fees charged upon return. We do not accept returns on special commission orders or artwork that is altered at the request of the customer. This includes any framing and matting options added to the order. Copyright © 2018 Kyo Gallery Online. All Rights Reserved.